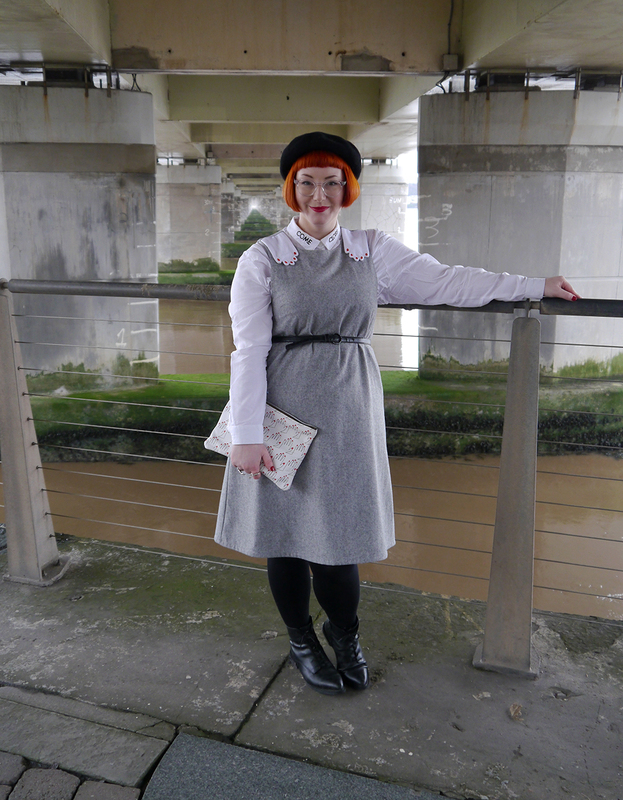 Hopefully, Kimberley's post has brought you round to the merits of a pinafore. 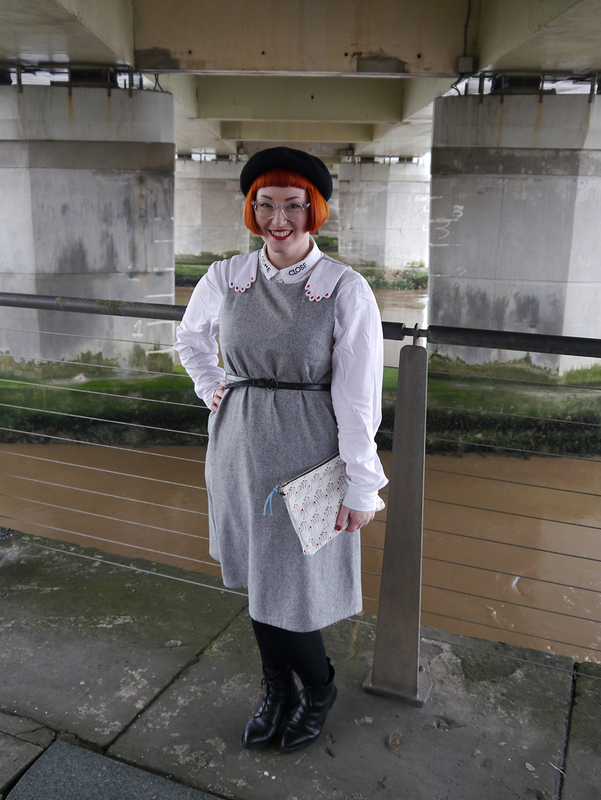 I'm all for a pinafore and certainly needed no convincing to don one for this Styled By challenge. While she might want to move away from the school uniform connotations, I like to fully embrace the style of my 8 year old self. Ok, so 8 year old me wasn't that stylish but you get the idea. All the elements are there - grey wool, white shirt, black boots. There's even a beret (for some reason that says school uniform to me). But, because each ingredient has a bit of fun in there, wearing this ensemble doesn't make me feel the dread of going to school. 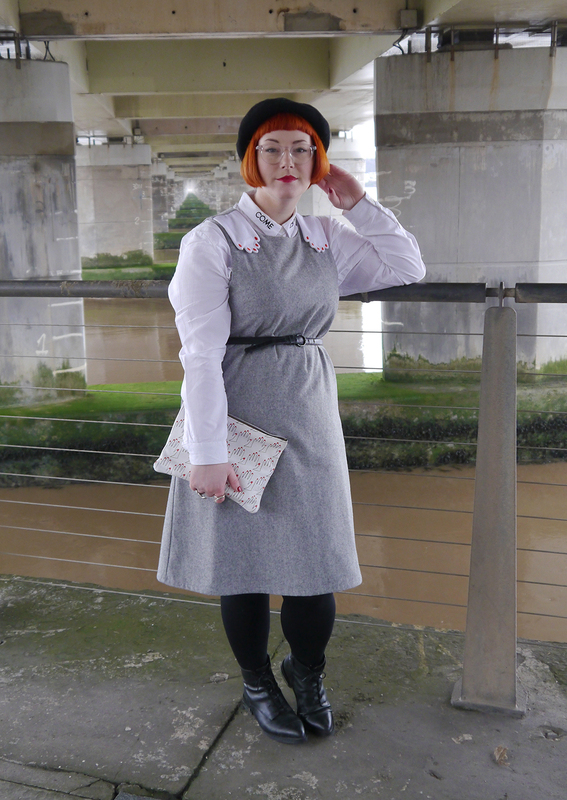 The Monki shirt is a wardrobe staple of mine. 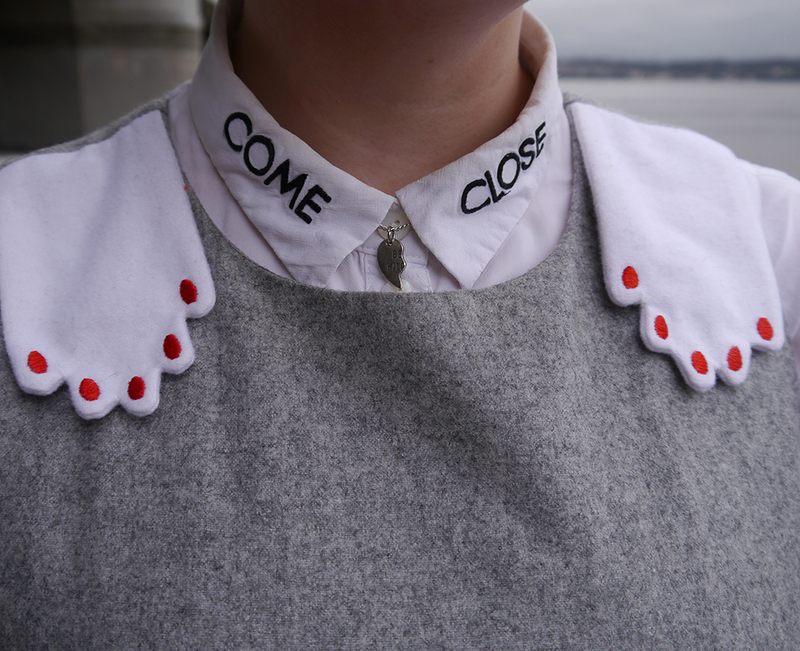 It's great for layering and the embroidered collar means it's not just a boring white shirt. 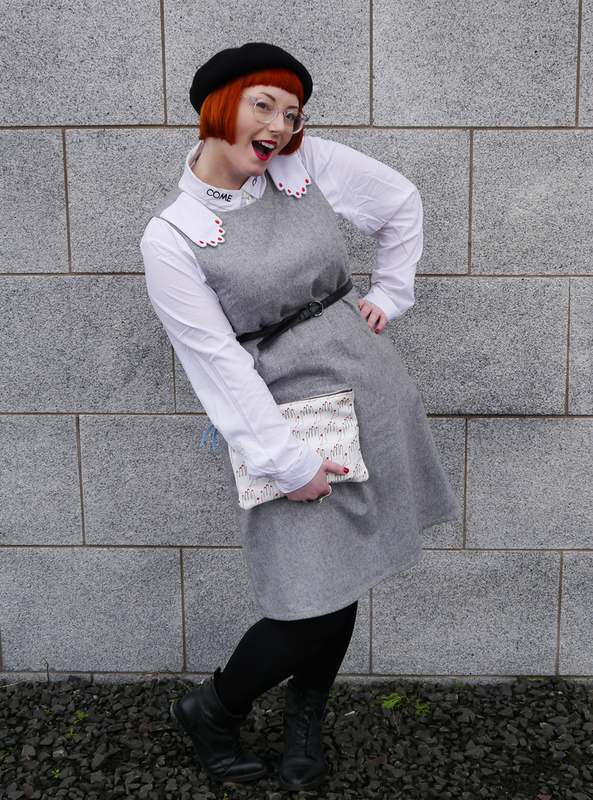 Then there's The Whitepepper pinafore dress. This was an excellent Christmas present from Heather Mac and it's quickly become one of my favourite things to wear. It's comfy, fun and there are pockets! The whole Whitepepper Sunday Morning collection is right up my street. They've pretty much got my style nailed. 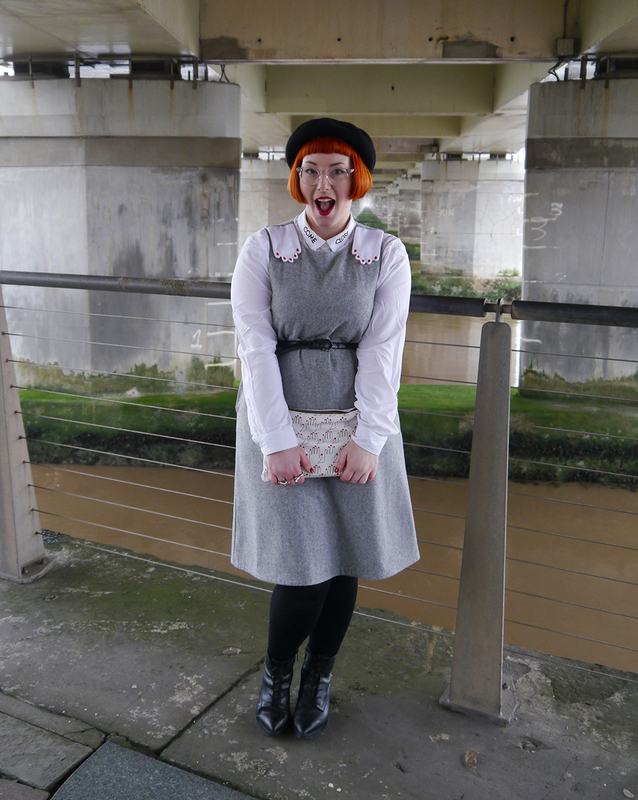 I then went for my fail safe matchy, matchy approach, adding my hand clutch bag and rings to the hands on the pinafore. There's something about hands in fashion that I just love. I've had this clutch bag for quite a while now but I've been keeping it hidden away to keep it nice. 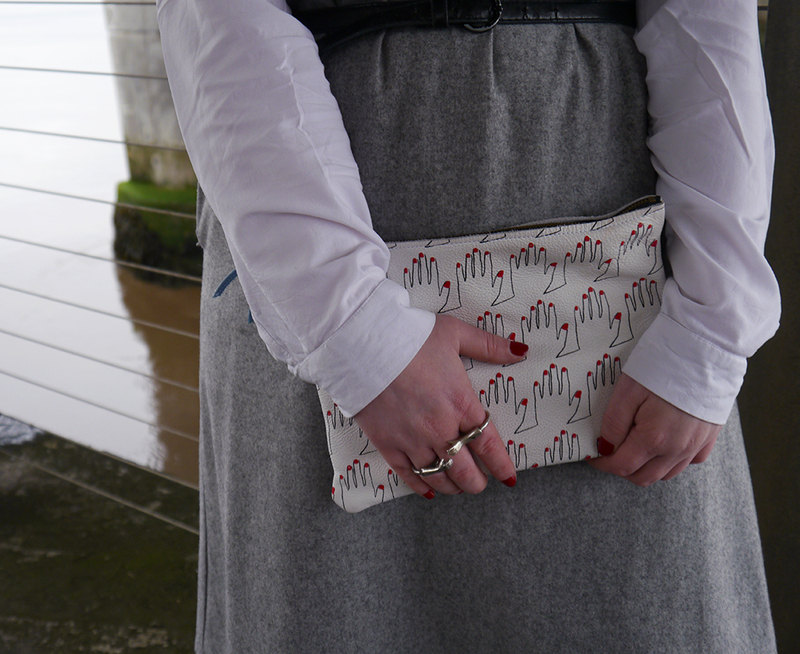 Falconwright's printed leather clutch bags had been popping up on my wishlists for quite some time. When I heard that the two designers were going their separate ways I knew I had to make one of their designs mine, before it was too late. This was the one I choose, though one of the eye ones would also have gone down a treat too. They were another brand that pretty much had my style down. Luckily both Sandi and Danielle have gone on to design lots of nice new items for me to add to my wishlists. I've actually been thinking quite a lot about my style lately and how it's reflected in my wardrobe. It all started with me reading The Private Life of A Girl's posts on The Minimal Wardrobe. The idea is all about creating the perfect capsule wardrobe, made up of quality pieces that are versatile and timeless. What speaks to me about this is the idea of opening up my wardrobe and loving every single piece in there. I mean, I'm pretty happy with what's in there at the moment. 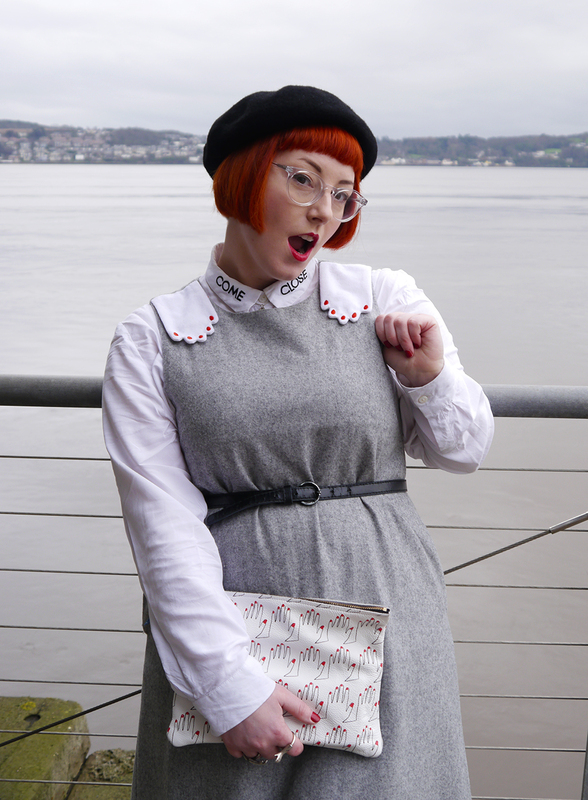 I have an awesome collection of items, by some brilliant independent designers. But there are a few pieces that don't make me feel quite so fabulous. 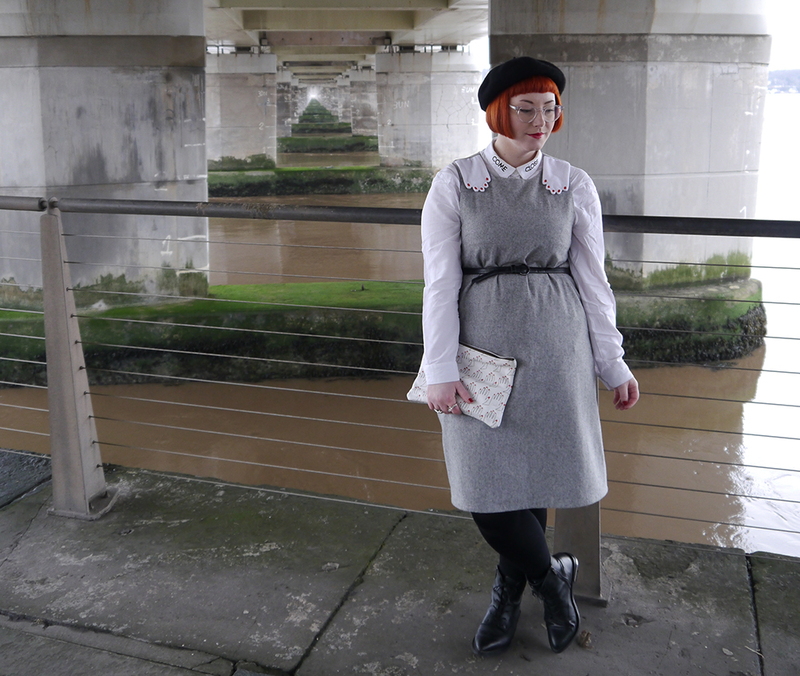 Things that I just wear because they're there, items that don't quite fit right and some pieces that should really go in the bin but are just SO COMFY! I think it may be time for a clear out, a bit of reorganisation and a look at my shopping habits. And what better time than the start of a new year. Think before I buy - I'm going to make more considered decisions. Think about how new purchases will work with what I already have and stop buying stuff to 'make myself feel better'. Shop small - support small businesses and designers. Pieces may cost a bit more, but I'll feel happier about where my money's going and have more quality items. Love, not lust - buy pieces that I'm going to have a long term relationship with, rather than a one season affair.